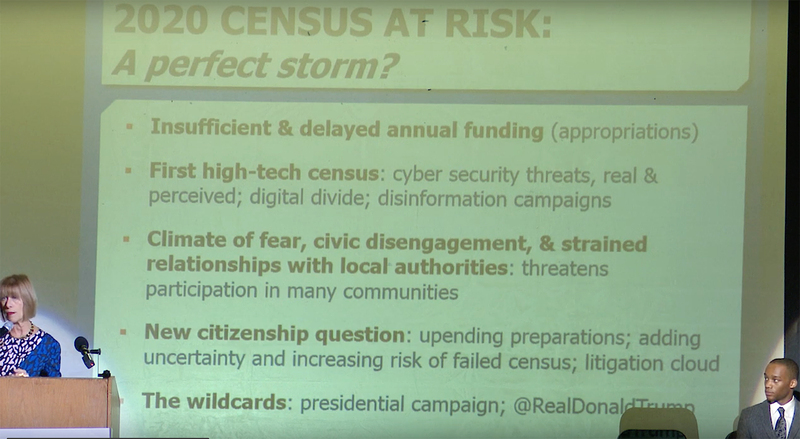 NORWALK, Conn. – If a “perfect storm” derails the 2020 Census, Congress won’t be reapportioned and there will be far-reaching consequences, census expert Terri Ann Lowenthal said at a recent Norwalk forum. Among other issues, under-representation of communities of color could be accentuated, Lowenthal said at a Jan. 27 League of Women Voters forum in Norwalk High School. “The bottom line is that lawmakers and civic leaders can’t make smart decisions and you can’t hold them accountable without an accurate census,” she said. Lowenthal is a nationally recognized expert on the census, the League said. She had a 14-year career as a congressional aide in both the House and Senate, served as staff director of the House census oversight subcommittee from 1987-94, and later covered the Census Bureau and broader federal statistical activities for the 2008 Obama Presidential Transition Team, according to her website. Lowenthal was joined onstage at Norwalk High by a panel of community activists, each of whom vowed to work toward educating residents so they would participate in the census, regardless of whether they are citizens. Insufficient funding has led the Census Bureau to “delay cut back and cancel a lot of important testing throughout this decade and remember the Census is unique among governmental activities. It cannot wait if it doesn’t have its funding to do what it has to do. It must be done, the Constitution says so, every 10 years and there are no do overs,” she said. The second issue is that “people are increasing reluctant to provide personal information online,” she said, and increasing use of technology introduces the risk of hacking or disinformation campaigns. Then there’s the “citizenship question added at eleventh hour” when the Justice Department, at the request of the Trump Administration, in March asked the Census Bureau to reinstate a question that hasn’t been asked since 1950, “without any field testing or consultation” despite fears that the late change would reduce participation and increase costs, Lowenthal said. She noted that the a legal challenge to the question is pending. Lowenthal asked the panel what they thought they would do to get the populations they serve to answer questions in the census. Patty Santos and Fernando Santiago said 90 percent of their clients at the Family & Children’s Agency are undocumented. People who feel threatened need to be spoken to face-to-face by people who are in their corner, NAACP member Darius Williams said. Moina Noor said that 75 percent of the Al Madany Islamic Center’s congregants are immigrants, many of whom come from predominantly Muslim countries. “I think there will be fear,” Noor said. She added that leaders need to mobilize to get congregants to register to vote, but there are still language barriers and computer literacy issue to overcome. Advocates “who understand the importance of the census and want to encourage everyone to participate are now not sure that we have the confidence that this Justice Department and this Department of Homeland Security won’t somehow try to find a way to breach the strict confidentiality protections,” Lowenthal said. An audience member asked if a completed census form would be negated if the citizenship question weren’t answered. “The Census Bureau can’t say this because the law requires your response to the census – though nobody has gone to jail for not answering – and therefore it requires a response to every question … Yes, you can submit your form if you have not answered all the questions. You will be able to do so online,” despite prompts to answer the question, Lowenthal replied. “The Census Bureau doesn’t have the resources and the people to go knock on a door if you just skipped a question or two. They will use administrative data that they have from other agencies… and modeling to help fill in the blanks,” she explained. Rather than telling frightened citizens to violate the law, “I would say, ‘Well, you know, while the law does require your response, do the best you can, it’s really important to be counted,’” she said. Lt. Gov. Susan Bysiewicz is expected to announce the creation of the Connecticut Complete Count Committee (CCCC) to inform and help direct the State’s efforts in the upcoming 2020 Census, she said in a Friday email. Mobilize City residents for the census ? Better to mobilize for lowering taxes and bloated City Hall salaries. Our local civics environment is largely determined by local and State legislators. Not our Congressional representatives. Hard to recall any significant legislation passed by our CT Congressmen that’s seriously affected our community. Would be nice to tally the numbers of illegals in CT. Some suggest its as high as 10%. And identify the sums of local and state public funding used to support such populations. There’s so much misinformation and disinformation about the Census. I’m glad to be able to get started now — more than a year before Census forms are sent out — in giving people the facts. Please post a link to back up your claims below. Always worth mentioning that almost 1 in 3 CT residents live in our major citiies, most of which are severely depressed. And have been for decades with large numbers of residents living at or below the Poverty Level.